This is a part of a chapter from our upcoming book “Integrated City Project”, a sample – large and complex project. The book is about how to use The Customizable and Adaptable Methodology for Managing Projects™ (CAM2P™) on such a project. In general control must be from the start to the end, of a project or a stage. Control, or monitoring and controlling, is about monitoring actual performance, the work that is being done. It is common that when a plan is being implemented (do), some things will not go according to plan. Therefore, it is necessary to check if this actual performance is in line with the plan. If not, then take action to correct and get back to plan, or as close as possible. This concept is from the PDCA Cycle. PDCA is well known in Total Quality Management and is the origin of the PMBOK® Guide process groups. 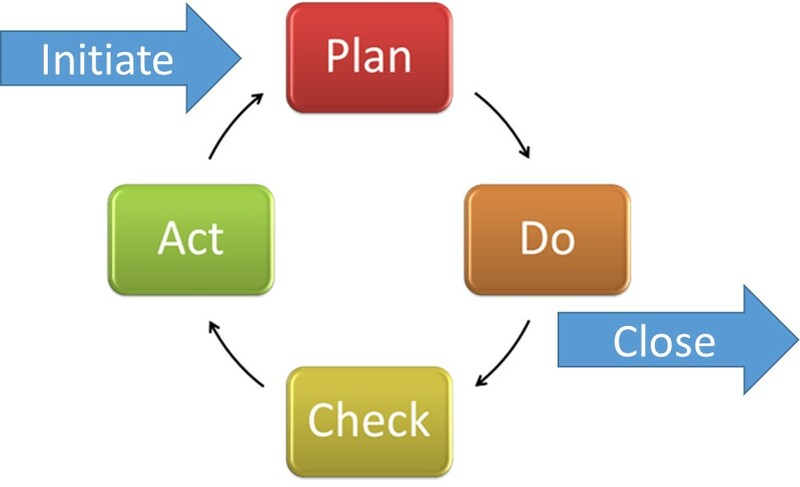 PDCA works well in operational environment where the cycle is continual. However, projects must have a starting and ending point. Therefore, there is difference between the traditional PDCA and process groups. In the project management environment, there is a need to initiate a project (or stage) and when done, it would be time to formally close the project (or stage). 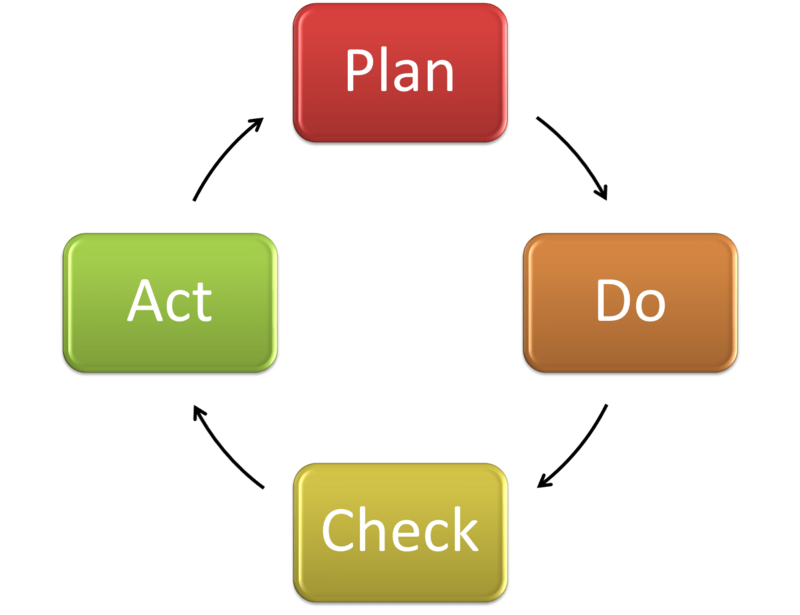 One more difference, in PDCA, the check and act are two independent steps, similar to monitor and control. However, for some reason, the PMBOK® Guide combines these two steps into one process group, monitoring and controlling. In the context of this book, ‘control’ refers to both steps, the monitoring steps which includes comparison between actual and plan and the controlling actions to stay on, or close to plan. The PMBOK® Guide has eleven processes in the monitoring and controlling process group, per the fifth edition of the PMBOK® Guide (The Project Management Institute, 2013). In the author proposed changes to PMBOK® Guide there are at least fourteen control processes. In the guide, “Monitoring and Controlling Process Group” is about the processes to control “project or phase” (The Project Management Institute, 2013). Control will take place at two different levels, at least; the project level and the stage (phase) level. At the project level, control is mostly in relation to the project life span and the project stages with control reference points that will move across the stages; refer to ‘What do we control against’ below. For control on the sample project, this would be in Part VI. At the stage level control is in relation to the process groups and follows the PMBOK® Guide, with or without modifications. Stage control will be addressed in more detail within each stage discussion in this book; in Parts III, IV, and V.
A study of Attachment 5 (earlier article include this chart), which is a modified version of the PMBOK® Guide process chart, one will notice that for every project management function (knowledge area) there are planning processes and controlling processes. It is worth noting that not every area has initiating, executing, or closing processes. What this means is that for every function, the project management team must plan ‘how to’ define, manage, control, and close ‘something’. Next, the team must control against such a plan by performing the monitoring and controlling processes. In the preceding sections of this chapter, it is stated that control is against the ‘plan’. This can be a confusing point here. It is common to think that control would be in comparison to a plan, the baseline. A common definition of a baseline is that it is an approved plan. Therefore, many practitioners think that control is against the Project Management Plan (per PMBOK® Guide) or a detailed plan. If control is against the approved plan (baseline) that means that control will be in parallel to the executing steps. Although most of the control actions are during executing control can still happen earlier. Consequently, control in the early part of a stage is typically more qualitative whereas after Stage Detailed Plan it can be a mix but mostly quantitative. In other words, as soon as a stage is initiated with the Stage Initiation Document control starts and it does not end until just before stage closure. Obviously, between the Stage Initiation Document and the Stage Detailed Plan there is a degree of ambiguity since initiation will not have the level of details available in a detailed plan. If we take the above discussion to the project level, then what do we control against? Refer back to Chapter 4 discussion on planning and ‘how to’ versus ‘do’. This entry was posted in Applying Project Management, Methodology-CAM2P, Project Life Cycle, Project Management Methodology, Project Management Process Groups and tagged CAM2P, CAMMP, Change Management, Control, PMBOK Guide, Processes, Project Change Management, Project Control on 7 February 2015 by Mounir Ajam.